Winter is a confusing time here in Utah. For some, this season is the joy of Christmas, a replenishment of our water supply, the snow capped beauty of our mountains or a welcome transition. For a skier, it’s a long awaited return for the most wonderful time of the year. For others, the winter is a destitute and despicable season with its short days, dangerous roads and endless shoveling. It’s a wet blanket in between the beautiful seasons of autumn and spring. 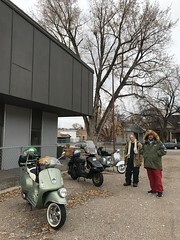 For a scooter rider, it’s a state of limbo where frequent visits to the garage are the only way to placate an overwhelming sadness. I love to ski. I spend no less than 20 days a year on the beautiful slopes of Utah and 2017 is turning out to be epic. We have had record snowfall and it’s made the skiing and snowboarding wonderful. I can’t recall the last time I’ve had so many powder days. It’s truly the best winter in recent memory. I love to ride. This endless white abyss has consumed our roads. I normally ride in the all season long. 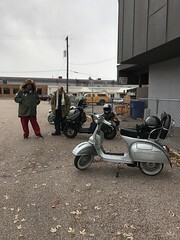 Since January 1st, I’ve scooted two days. The snow just keeps piling up and when it hasn’t been snowing, temperatures have been dropping to well below freezing keeping everything icy and dangerous. It’s truly the worst winter in recent memory. This is an endless bi-polar emotional state. When we finally start to thaw and the warmth overtakes the cold, I will begin to tire of driving up to the resort for wet sloppy conditions and Spring crowds. Skiing will begin to lose its luster. The prospect of scootering will overtake my joy of skiing. 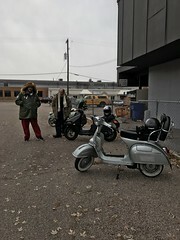 Rallies, rides and seeing all my Two Bit friends will stoke the desire to be on my Vespa more than ever. 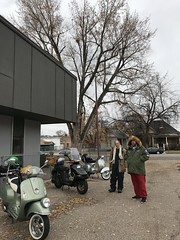 I will savor these moments on my scooter but once the autumn returns and that first ski magazine shows up in the mail, my mind will start to remember the joys of this winter. Still, I’ll also keep riding. Perhaps I have come to a tipping point. 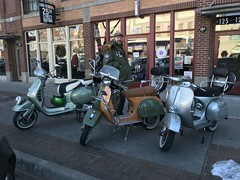 Maybe my love of skiing is being overtaken by my love of scootering? 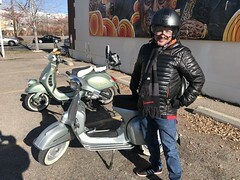 For now, I will saver both my time on skis and look forward to the time on my scoot.